There is room to sit down to take off your shoes as well as hide your hats and gloves in this beautiful solid wood Basket Towers with Bench and Shelf. This entryway set is available in several wood types and finishes to fit the décor of any home. This solid wood Amish bench set comes standard with eight woven baskets on full extension slides and a vinyl cushion on the bench. You will be happy with all of the storage space to get your home entryway organized. 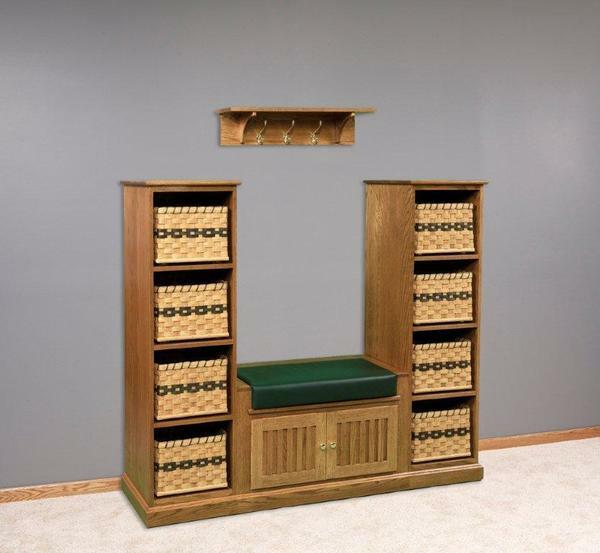 Order online using our safe and secure check out or visit our Amish furniture store in Sarasota, Florida. You can also give us a call at 1-866-272-6773 with questions, to order samples or place an order over the phone.